In the 1996/1997 time frame, the U.S. Air Force began to define plans for building blocks of a future Military Spaceplane (MSP) system. The full scope of these plans came to public attention in January 1998, when the Air Force Research Laboratory (AFRL) Space Vehicles Directorate (VS) requested proposals from the industry to study various aspects of advanced military space technology. This included research related to a potential MSP system. The latter was to cover concepts for RLVs (Reusable Launch Vehicles), SMVs (Space Manoeuver Vehicles, see X-37/X-40), so-called CAVs (Common Aero Vehicles, see X-41/Falcon) and finally pop-up upper stages. Pop-up upper stages were defined as rocket stages, which could be used by RLVs or ELVs (Expendable Launch Vehicles) to boost payloads to their final orbits and/or to perform orbital manoeuvers. Earlier, in 1997, the AFRL had already begun a formal program to develop a pop-up upper-stage, named the Modular Insertion Stage (MIS). The MIS was defined as an expendable, low-cost, liquid-fueled upper stage, which could be scaled by using one to three rocket engines (hence the "modular" label) to suit all expected user needs. It had already been determined in AFRL-sponsored studies in 1997 by TRW and Rocketdyne, that the best-suited propellants for the requirements (storable, non-toxic fuels) would be hydrogen peroxide and kerosene. Subsequently, AFRL cooperated with NASA's Marshall Space Flight Center (MSFC) in funding and management of further development of the MIS. MSFC had its "Bantam" low cost lift program running since 1997, and this provided a suitable contractual framework for the MIS effort. It was decided to build an MIS flight demonstrator, called Upper Stage Flight Experiment (USFE), and Orbital Sciences Corp. (OSC) was eventually awarded a contract to design and build the USFE. At some time in late 1997 or early 1998, the designation X-42A was officially allocated to an expendable demonstrator for pop-up upper-stage technology. However, this designation has so far not been further used in any official announcements, and therefore it is unclear if it will be actually applied to the USFE project (in fact, that doesn't appear too likely; see RLV section below). Construction and component testing of the USFE prototype proceeded through mid-2003 on a relatively low-key basis. However, in that year a tank failure during a helium pressurization test completely destroyed the engine. Since then, a second prototype has been built, but propellant tank leakage problems have again delayed the program. If tests with a new tank, scheduled for early 2006, are successful, the USFE could be ready for a flight demonstration by May 2007. For this test, the USFE would be fitted as the third stage on top of a two-stage booster provided by OSC (most likely the first two stages of a retired Minuteman missile). The X-42 designator has also been unofficially used by the AFRL and the industry in 2002 for a possible RLV demonstrator. Orbital Sciences Corp. (OSC) has presented a design, which is based on its Multi-Role Reusable Vehicle (MRRV) concept, a winged vehicle powered by a single RS-27 rocket engine. The significance of the use of "X-42" for this proposal is not quite clear, but it appears to emphasize that the vehicle could be a reusable solution to the upper stage requirement. By 2003, this design had slightly evolved, featuring a single vertical tail on the fuselage instead of the wingtip fins. A single CAV (Common Aero Vehicle) could be carried atop the fuselage and launched in space. OSC's X-42 was equipped with a conventional tricycle landing gear and a braking parachute in the aft fuselage. The vehicle was designed for versatile trajectories and short turn-around time on the ground (14 days), making it a true "space launch workhorse". 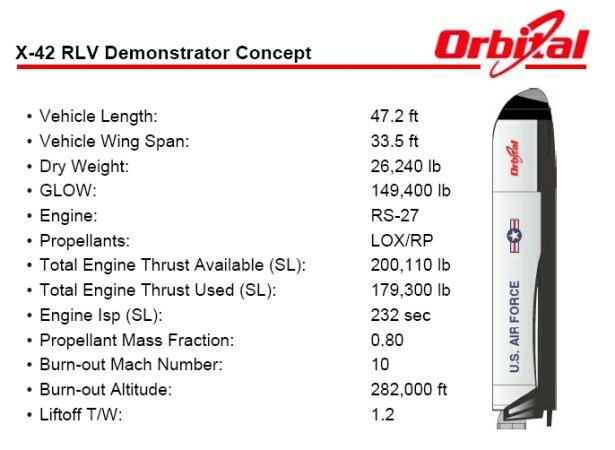 The X-42 label has also been informally used in a few papers and presentations to refer to other proposed test vehicles related to RLV and TSTO (Two Stage To Orbit) technology. The acronym RAST (Reusable Access to Space Technology) has also been mentioned together with X-42. All said, it looks as if the X-42 designation is currently not tied to a specific program or vehicle. No dimensional or performance data for the USFE is available.